OVERVIEW: This cooling unit is designed to be mounted inside your equipment cabinet or desk. It has a high-quality, low-noise 120mm fan, with long-lasting and quiet fluid dynamic bearings. YOU control the fan speed, using the multispeed fan controller. The system also includes a 12 volt trigger control module, which turns the fan on and off, under the control of your receiver's 12v trigger socket. The module detects the 12v signal, then sends the power from the multi-voltage transformer to the fan. THE COOLING SYSTEM INCLUDES: 1 x 120mm cabinet fan unit, 1 x 12v trigger control module, 1 x multi-speed power transformer, mounting hardware, and printed installation instructions. All cooling system parts connect together using special heavy-duty Molex quick-connect plugs, which allows the parts to be separated for easy wire-routing. 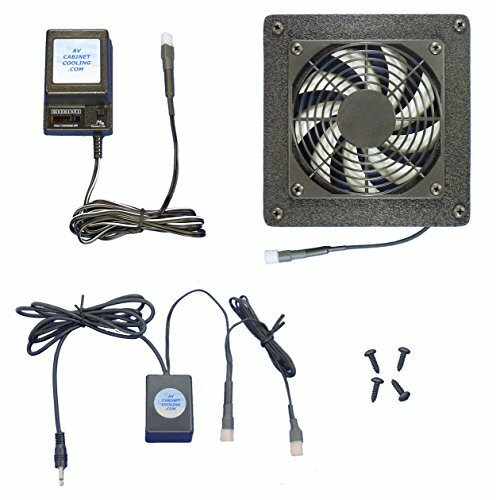 The fan can be up to 6' from the 12v socket. SETUP: The standard system comes set up so that hot air enters the front of the fan unit and exits out the back. If you need to have air coming out the front, just let me know. There is no extra charge for this option. You can also easily change the fan orientation later, if necessary. The system comes with instructions and a mounting template to facilitate installation. It comes completely assembled, with all components installed, wired and ready to go! GUARANTEE: Your satisfaction is guaranteed. You can return the system for any reason within 30 days -- just contact me (through Amazon) and I will send you a prepaid return shipping label. Since starting in 2005, AV Cabinet Cooling has sold over 10,000 cooling systems, and we are dedicated to great customer service. WARRANTY: Your purchase is also covered by a 12 month parts & labor warranty. This 120mm cooling fan unit is designed to be mounted inside your equipment cabinet. It will quietly pull the warm air out of your cabinet and exhaust it out the back or top. It has a high-quality, low-noise 120mm fan, with long-lasting and quiet fluid dynamic bearings. The system has a 12 volt trigger control module, which turns the fans on and off, by monitoring your receiver's 12v trigger socket. This module sends power from the multi-voltage transformer (included in the system), which runs the fans. IMPORTANT: Some receivers have a non-standard setup, where the receiver doesn't directly control the trigger (for example, the trigger might be under the control of Zones 2 or 3, etc.). Please consult your receiver's manual for details about how its 12v trigger operates, or contact me if you have questions. Recommended fan speeds: The 120mm fan is rated at 19 db, while moving 55 cubic feet of air per minute (3/4 speed). The fan has approximately these specs at different speeds: 1/3 speed = 25CFM at 10db, 1/2 speed = 37CFM at 13db, 2/3 speed = 49CFM at 16db, and full speed = 74CFM at 22db (approximate). With cabinet cooling, slow (and quiet) are the way to go! The cooling fan unit measures 6-1/4 square, by 1-1/2" deep. If you have any questions about this product by AV Cabinet Cooling, contact us by completing and submitting the form below. If you are looking for a specif part number, please include it with your message.